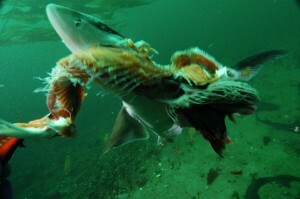 Spiny Dogfish Munch Viruses? – Ya Like Dags? Editor’s Selection Icon I’ve been on hiatus for a little bit as I adjust to the workload inherent in starting a PhD program (while putting the finishing touches on a thesis, but that’s neither here nor there…), so that’s my excuse for not posting on this story until pretty much everyone else had. In case you hadn’t heard, the compound squalamine, found in sharks (and named for the spiny dogfish) and sea lampreys, is apparently capable of inhibiting and even halting the spread of viruses in human beings. Unfortunately, sharks have a long and unfortunate history of being associated with supposed “miracle cures,” often to the detriment of the sharks. I managed to get a look at the actual paper (tip o’ the hat to Lyndell, even if she never blogs anymore) to see how this new breakthrough works out for both people and sharks. Do dogfish also do this to viruses? Photo by Andy Murch (elasmodiver.com). Zasloff et al. (2011) note that spiny dogfish tend to be highly resistant to viral infection, despite the fact that sharks don’t have the same kind of adaptive immune system found in humans and other “higher” vertebrates. How does this happen? Squalamine, baby! Squalamine has previously been tested in humans as an antibacterial and cancer-fighting agent, but it seems to show the most promise fighting viruses. But how does a single compound found in sharks do a job that we humans, with our “advanced” mammalian immune system supported by the finest in modern medical science, still struggle with? As a knuckle-dragging “big fish eat little fish” ecologist, I don’t quite have the background to speak too intelligently about immunology or even molecular science, but hopefully I understand the mechanism correctly (any readers with a medical background can feel free to correct me if I totally blow it). What seems to be happening is that squalamine affects the electrostatic charge of any cells in contact with it, displacing proteins that anchor the cell membrane and inadvertently making those membranes difficult or impossible for viruses to get through. If you’ll recall Bio 101, viruses do their dirty work by invading and hijacking cells, reproducing inside them, and bursting out, destroying the cell in the process (a gross oversimplification I know, but again, knuckle-dragging ecologist here). The idea is that you could be the baddest, most drug-resistant, immune system-targeting phage out there, but if you can’t get through the cell membrane in the first place you’re pretty much screwed. Apparently squalamine makes this happen. Zasloff et al. (2011) tested doses of this compound on mice and hamsters against a wide-ranging rogue’s gallery of nasty viruses. Dengue virus, two types of hepatitis, yellow fever, EEE, and MCMV were put to the test, and all were inhibited in some way by the mighty dogfish juice. A dose of 40 μg/mL was sufficient to cause 60% inhibition in the dengue virus, while 20 μg/mL was enough to knock back both types of hepatitis. Immediate treatment with squalamine cured 60% of hamsters infected with yellow fever, while delayed treatment saved 40% (as opposed to 100% mortality among untreated animals). Squalamine also extended the survival of hamsters infected with EEE and reduced the concentration of MCMV in various tissues of treated mice. No virus escaped unscathed after meeting a mere extract of the mighty spiny dogfish in combat! So this is all pretty promising, and squalamine has been tested in humans before, so its potential health risks are already known. This means that squalamine is pretty much primed to be mobilized as an antiviral treatment. But does this mean that dogfish are going to be harvested in obscene numbers to satisfy the need for squalamine? After all, it was demand for shark liver oil, supposedly good for your health, that lead to the collapse of the the North Pacific spiny dogfish fishery. Not to fear, it turns out that squalamine can be synthesized in the lab, meaning that no sharks need be harmed in ridding you of that nasty case of dengue fever. Just one more example of spiny dogfish secretly being one of the most badass creatures in the ocean. It’s a potentially interesting finding, but I’m still pretty skeptical at this point. First, the claim about a species being “highly resistant to viruses,” sets off alarm bells for me. How do we know that? Who did the comprehensive analysis of spiny dogfish, and proved beyond a shadow of a doubt that they don’t harbor as many viruses as other species (including both culturable and unculturable ones)? If that work involved deep sequencing, what probes did they use? In other words, how are we so certain that the apparent shortage of viruses in dogfish isn’t just a product of our not having looked hard enough? Second, I find it pretty incredible that a compound that’s broadly disruptive to membrane binding won’t come with some kind of horrific side-effects. Third, it’s pretty unlikely that a broad-spectrum antiviral compound will last very long even if it does exist. There would be enormous selective pressure for a virus to develop resistance to this treatment, and every time we’ve put such pressure on a virus in the past, it’s figured out a way. Alan, I was hoping you’d comment on this. The paper did mention something about a dose of over 60 μg/mL being detrimental to cells, but didn’t really go into specifics. I’m assuming that since squalamine has actually been tested on humans before that the risks are known, but honestly this is the first I’ve really followed of the story. I’m a much better ecologist than immunologist, so it’s definitely good to have some insight from the medical field.